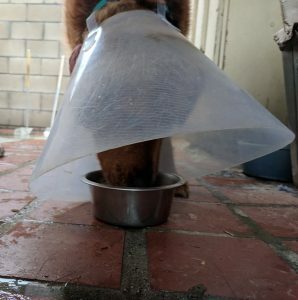 Every pet parent who has to take home his pet with a cone on, asks if their pet really needs to wear an E collar (Elizabethan collar). Surgeons always try to leave your pet with a nice clean incision and pets have an amazing skill to ruin that. They can chew up twenty stitches or staples in less than two seconds. Even if you see them start, it’s usually too late to stop them. People don’t really believe that they will do that to themselves. Also the urban legend that says animal saliva speeds up healing, it really slows down healing instead. The tongue, especially in cats, is very rough and can ruin the healing scabs. Not only that, it starts with licking and then moves on to nibbling and chewing. Without the E collar, a pet can destroy a scab that took weeks to form. 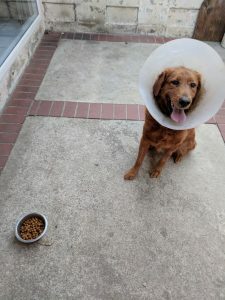 Many times parents who remove the cone, find that it costs them a lot more money for the wound to be rest restricted with anesthesia and medication again. The only way to handle it is to leave it on all the time. This way the pet gets used to it. If you take it off sometimes, the pet thinks the cone is a punishment. He may spend all his time trying to destroy it. Pets don’t hold grudges (though sometimes we wonder) so they won’t hold it against you. 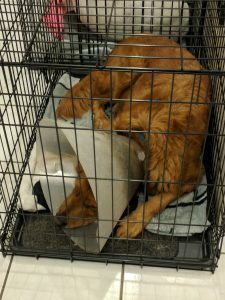 You pet can pee, poop, eat, drink and sleep with the cone on. There are other options but they don’t work as well. You can use bitter apple around the wound but some pets love the taste of it. There are softer collars at the pet store and they could be tried too. If it’s a chest wound, they have Tshirts for that. Ask your veterinarian in Burbank if he has ideas or options for you. Still the E collar is not for shaming, it’s the best way for quicker and better healing of surgery or skin wounds!